During World War 2, Ottawa’s Rockcliffe air base operated a total of six B17 Flying Fortress aircraft that were outfitted as transport “mailbirds” ferrying thousands of letters and packages between Canada and the fighting forces overseas in Europe. Tracing the serial numbers of each of the B17s I was able to uncover what happened to each of these mailbirds during their wartime mail missions. Most were eventually either damaged or scrapped, but one in particular, B17 Serial#9203, went mysteriously missing. 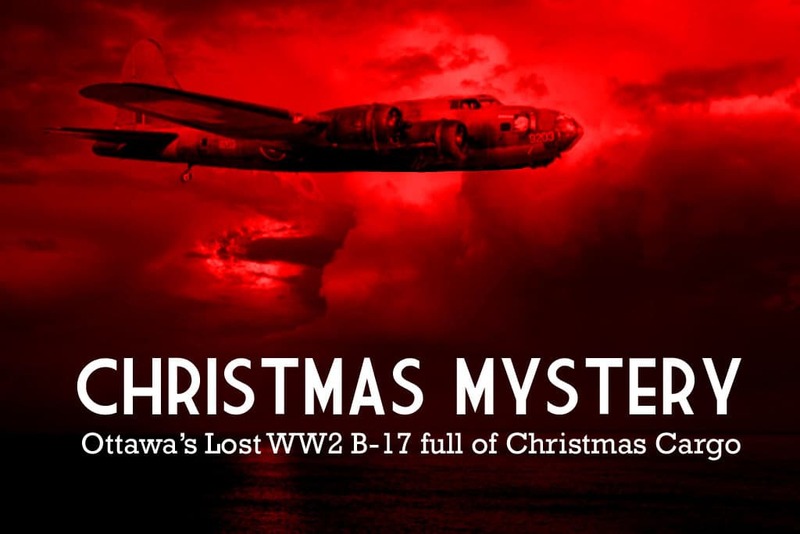 This is the story of Ottawa’s lost B17…a MailBird Mystery. In October of 1943 Rockcliffe airport became the site of 168 Heavy Transport Squadron which was formed to handle the large quantities of mail that needed to be delivered to personnel serving in the European and North African campaigns during World War Two. 168 Squadron became the site of a bustling hub of mail from across Canada that needed to be delivered to the troops and service personnel overseas. Love letters, family correspondence, birthday and holiday gifts as well as freight were all transported to the men and women far from home, boosting morale and keeping them connected to loved ones back home. B17-9203 had just delivered a load of Christmas mail to Canadian troops serving in North Africa through a Royal Canadian Air Force base in Morocco. USAF file photo of Hillcoat’s B17-9203 from Rockcliffe painted in RCAF markings. Note serial number “9203” painted on the nose. On December 15 1944 the aging B17 Flying Fortress from Ottawa, handed down from the United States Air Force, was loaded up with return Christmas mail bound for the Nation’s Capital. Pilot Horace Hillcoat and his crew of eight prepared the B17 to return home for the holidays with their precious Christmas cargo. Throttling up the four radial engines of the B17, Hillcoat lifted the mailbird into the Moroccan skies, heading for the Azores, a small group of islands in the North Atlantic Ocean. After a brief stop there, Hillcoat would then fly to Newfoundland before reaching his destination at Rockcliffe, Ottawa. Leaving the African shoreline, Hillcoat took the B17 across the Atlantic headed for the island airstrip some 1,500 km away. As they lost sight of the African coast, B17-9203 and its crew were never heard from again. When contact was lost with Hillcoat’s B17, a search and rescue mission scoured the area of the ocean where the plane may have disappeared. Some mailbags were found floating on the surface of the ocean, but no other signs of wreckage, survivors or debris were ever found. No distress calls or radio contact was made before the plane disappeared. B17-9203 had simply vanished. Hillcoat and the crew were classified as “Missing”. Was Hillcoat and his crew ambushed by attacking German Luftwaffe aircraft, sending them to a watery grave? Did the well-used B17 suffer a mechanical malfunction and Hillcoat unsuccessfully ditched his plane in the Atlantic? Another theory is that the ill-fated B17 was shot down by anti-aircraft guns aboard a German U-boat prowling the waters below the B17. A number of German U-boats shot down Allied aircraft in the vicinity of the Azores, a fate that could have taken down Hillcoat’s aircraft. Numerous U-boats were also sunk by Allied anti-submarine patrols in that area with their sub crews taking their secrets and records to watery depths. It is quite possible Hillcoat’s B17 was shot down by one of these sunken U-boats with the story submerged along with it. The pilot of the vanished B17, Horace Hillcoat, lived here, at 517 Kirkwood Avenue. His house is still there. Hillcoat and the rest of the crew aboard the ill-fated Christmas B17 are part of the Commonwealth Aircrew Memorial on Sussex Drive.